Seen as though its nearly the end of summer and we are approaching the Autumn season and months, I thought this would be the perfect time to kick off a new little 'series' titled Autumn Picks. By far my favourite season for so many reasons, and what better way to talk about it then blog about it! Each post that you see over the next three months will be all about different things, including makeup, clothes and even some random foody things! To read all the posts from this series click here and soon you will be able to see them all! This post is going to be all about the NEW BarryM Gelly's that have launched, I only picked these up yesterday and just had to post a quick swatch and tell about them. For me the change in my nail colour and lip colour is the start to any new season, and this new collection has got me super excited! There's a total of 6 new shades in the collection, and being a big fan of them already I KNEW that I had to pick up at last 3 of the new colours and they were 3 for 2 in Superdrug..sooo?! 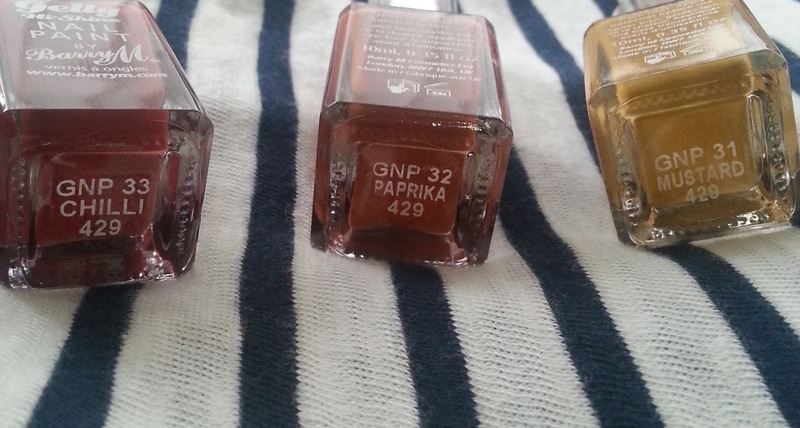 There are around 6 new shades I think, but these three appealed to me most..who knows I may just buy the others, but I own similar to those colours and the ones I did pick up are different to any others I have every owned. I love these three colours, they scream Autumn! The names are so cute and so are the colours! The swatches above are two coats and I think that if you are looking for some transitional colours to take you in to the next two seasons then these are defo for you. My favourite of the three has to be Paprika because its a colour that I don't own and is so pretty when I saw it in real life, but the other two also need an honourable mention!